As some of you may know, Shorecrest Preparatory School’s Administrative Leadership Team is in its second year of a SEED group. We are excited to offer parents/guardians an introduction to the program for this year and hope you will join us. SEED, The Seeking Educational Equity and Diversity Project on Inclusive Curriculum was developed and launched at the Wellesley College Center for Women in 1987. It is the nation's largest peer-led leadership organization through which participants develop ways of understanding complex relations between self and systems with regard to race, class, gender, sexual orientation, physical ability/disability, and other cultural experiences. We would love to invite you to see what this is all about in an introductory, welcome session. The second of these meetings will take place on December 13 from 7-8:30pm in the Media Center/Library Classroom. A light dinner will be served. 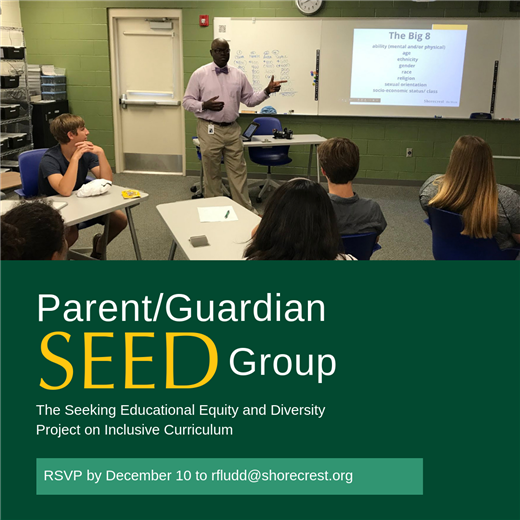 If you are interested in participating in any of this year’s Parent/Guardian SEED group introductory sessions, please complete this form by December 10, 2018. At the end of the form is a brief writing assignment that you will bring with you to the next meeting. If you attended the first session, you are more than welcome to attend any/all of the following sessions. Please share any questions that you may have with Roderick Avery Fludd, Director of Diversity and Inclusion, at RFludd@shorecrest.org. We look forward to welcoming you to our next session.